UVic PhD candidate Libby Concord speaks on The Organ Wars: The Development and Expansion of Religious Institutions and Music in Victoria, B.C., 1859-1901. As the city of Victoria, B.C. 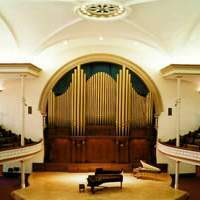 expanded throughout the late 19th century, its religious institutions began to compete with each other for the best musical display. Ms. Concord will explore the benefit concerts that funded this effort, the movement of organs between churches as new ones were purchased, and cultural impacts of this musical motion. Early registration rates are in effect until April 30.